'Wireless' does not mean easy. Chicago-area retirees turn to integrator Orbis Solutions for 30-speaker Beale Street Audio wireless audio solution driven by Sonos amps. Orbis Solutions of Aurora, Ill., used nine Sonos Connect amps to drive 30 Beale Street Audio architectural speakers for the project. Just because a system is "wireless" it does not necessarily mean it is simple to set up, configure, and install. That is the lesson a retired couple in Chicago recently learned when they brought in a professional custom integrator. The couple purchased a new home in 2013, and during the design process, they had the ceilings prewired for multiroom audio. However, at the time they did not get around to completing the speaker installation. Years later they decided it was time to get their whole-home audio system up and running, but with no previous experience installing in-ceiling speakers—let alone the knowledge of which speakers they should buy—the homeowners decided it was best to involve a professional. 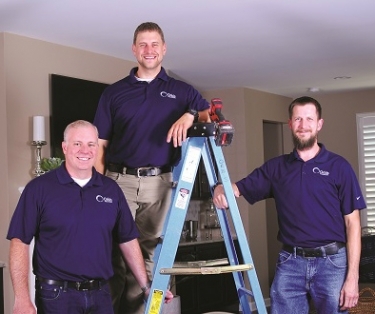 They called on Orbis Solutions, an Aurora, Ill.-based provider of A/V and IT services. After talking to the homeowners, representatives from Orbis recognized that a décor-friendly, easy-to-use system with high-quality speakers was imperative. The house had been pre-wired for 30 in-ceiling speakers, allowing for music in every room, but the homeowners were not looking for a complex automation system that required multiple remotes and bulky electronics. Instead, they insisted that the equipment be hidden away and that they be able to select and play their music all with the touch of a button from a phone, tablet, or keypad. Orbis was tasked with designing a system that offered discreet solutions, exceptional sound, and wireless streaming capabilities. Having been recently introduced to Vanco International’s speaker brand, Beale Street Audio, and hearing the level of performance that Beale’s patented Sonic Vortex technology provided, the technicians at Orbis Solutions specified Beale’s in-ceiling speakers for the entire indoor system. “We are big fans of Beale Street Audio because of their unique engineering and design,” says Justin Tamm, lead installer for Orbis Solutions. Orbis Solutions technicians also chose Beale Street speakers for this particular installation because of the broad selection of in-ceiling speakers and sizes available. “One of the benefits of our Beale Street Audio line, is that there is a speaker solution ideal for any installation type, allowing for consistent sound from room to room,” says Mark Corbin, president of Vanco International. In this case, the Orbis technicians were able to select a speaker model (ICW4-BM) to match the 4-inch cut-outs of the can lighting in the kitchen. To deliver broad sound and deep bass throughout the rest of the home with the same acoustic signature, Orbis technicians installed 6.5-inch IC6-MB in-ceiling speakers, and 8-inch, IC8-MB in-ceiling speakers, all of which utilize Beale’s Sonic Vortex ported transmission line. To keep the installation as clean as possible, all speaker wire was run to a Rapid AV rack in the basement where nine Sonos Connect:Amp amplifiers were installed to provide the power and wireless streaming capability the customers desired. Orbis also installed iPort xPRESS stylish audio keypads throughout the house to give the homeowner’s the ability to play their Sonos system instantly when their phones or tablets were out of reach. Orbis installed a total of 30 Beale Street Audio speakers throughout the interior of the house in the kitchen, living room, master bedroom, master bathroom, and guest bedroom. Check out the slideshow for more images of the install! With the option to retrofit different speaker sizes that utilize the same integrated enclosure, the team was able to pick the right speakers for each space and provide uniform sound from room-to-room, regardless of room size or configuration, from small rooms like the bathroom to large rooms like the open-concept kitchen and living room. Orbis Solutions technicians were able to install the speakers with minimal effort. “Beale Street speakers ship with a cut-out template and an alignment crosshair for precise placement of speakers in the ceiling aligned with can lights and other décor. This significantly reduced the installation time, as well as allowed for perfect speaker alignment – a major bonus,” says Tamm. How in any way are 30 (wired) in-ceiling speakers, connected via those wires to Sonos amps “wireless”??? I guess it’s the iPort Express parts you’re referring to? 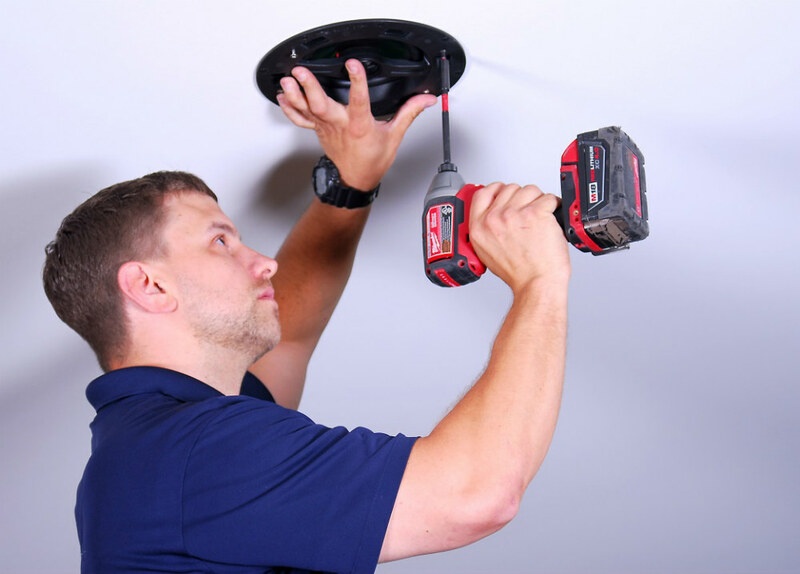 18V impact driver to install in-ceiling speakers. My question of why I find so many broken speaker dogear tabs has been answered. Did I miss the part about how 9 Sonos Connect:Amps became 15-zones….? Great story on Beale! Thank you Julie and thank you Orbis for choosing Beale.